Summary and Definition: The Hopi tribe are a peace-loving people who have kept their culture intact due in large part to living in isolated areas of Northeastern Arizona. The names of the most famous chiefs of the Hopi included Chief Dan and Chief Tuba. The Hopi tribe are famous for their beliefs that encompassed the Kachina dolls and the Hopi Prophecy. What was the lifestyle and culture of the Hopi tribe? The Hopi tribe were villagers and farmers. Their villages were located in the lofty plateaus of northern Arizona. The Hopi tribe have kept their culture intact due to living in such isolated areas. The name Hopi means “peaceful ones” which aptly describe the members of this ancient American Indian tribe. Each Hopi village was divided into clans that is governed by a chief, who is also the spiritual leader of the village. The Hopis became noted as stockbreeders and skilled weavers, potters, and silversmiths. Where did the Hopi tribe live? The Hopi are people of the Southwest Native American cultural group. 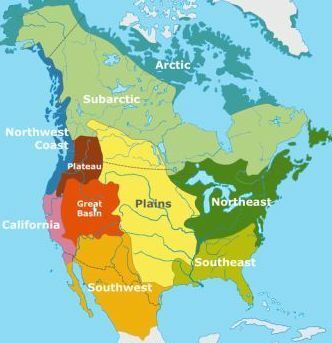 The location of their tribal homelands are shown on the map. The geography of the region in which they lived dictated the lifestyle and culture of the Hopi tribe. What did the Hopi tribe live in? The Hopi tribe lived in adobe houses also known as pueblos that were suitable for the warm dry climate in which they lived. The Adobe, or pueblo homes, were multi-story houses made of adobe (clay and straw baked into hard bricks). 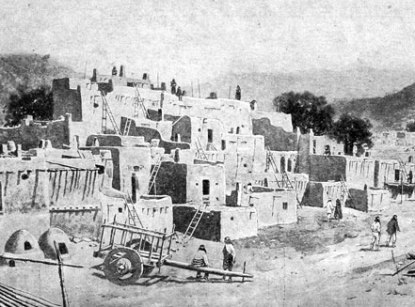 The above photograph shows the multi-story houses that were typical of a Hopi Village. What was the religion and beliefs of the Hopi tribe? The religion and beliefs of the Hopi tribe are based on Animism that encompassed the spiritual or religious idea that the universe and all natural objects animals, plants, trees, rivers, mountains rocks etc have souls or spirits. The Hopi tribe are strongly associated with Kachina dolls. The Kachinas represent the powerful spirits of deities, animals or natural elements who can use their magical powers for the good and well-being of the Hopi tribe, bringing rainfall, healing, fertility and protection. Each of the Kachinas hold different powers. Kokopelli is the most famous of all the Kachina spirits. The Soyal Solstice Ceremony is a major Hopi ceremony which is celebrated over a period of sixteen days which starts with prayers and supplications and ends with a feast and Kachina Dance. The nation are also famous for the Hopi Prophecy that warns others about consequences of their actions providing details of signs of changes to come. Their Religious ceremonies involved secret rites held in semi-underground kivas. During these sacred ritual masks and costumes were worn to impersonate kachinas (ancestral spirits). The Hopi did not paint their faces or bodies except for special religious ceremonies. The ceremonies of the Hopi tribe were elaborate in nature, and in the famous "snake-dance" the performers carry live rattlesnakes in their mouths. The Tapuat is the Hopi symbol for mother earth which depicts a maze. What language did the Hopi tribe speak? They spoke in the Uto-Aztecan language which was also spoken by members of the Pima, and the Papago tribes. What did the Hopi tribe eat? The food that the Hopi tribe ate included meat obtained by the men who hunted deer, small game and turkeys. As farmers the Hopi Tribe produced crops of corn, beans, sunflower seeds, squash, and melons in terraced fields. Crops and meat were supplemented by nuts, berries and fruits. They then started to raise sheep and goats. The Hopi tribe often traded with their produce with other Native American Indians that lived in the Southwest. What weapons did the Hopi use? The weapons used by the Hopi tribe were originally bows and arrows, spears and knives. The rifle was added with the advent of the European invaders. What clothes did the Hopi men wear? The clothes worn by the men included breechcloths or short kilts which were made from a long rectangular piece of animal skin or cloth which was worn between the legs and tucked over a belt. During the 1800's men started to wear cotton tunics with a leather belt fastened around the waist. They wore moccasins made of soft leather - a soft, light beige, slip-on shoe, consisting of a sole and sides made of one piece of leather. The traditional headdress worn by the Hopi men were simple cloth or leather headbands. What clothes do the Hopi women wear? The type of clothes worn by the women of the Hopi tribe were knee-length cotton dresses called mantas which were fastened at a woman's right shoulder, leaving her left shoulder bare. Hair was kept long and worn in a traditional chongo style with a hair knot called a Hömsoma which was wrapped in white yarn. Like all women they liked jewelry and wore turquoise and silver ornaments. Who are the most famous leaders and chiefs of the Hopi tribe? The most famous leaders and chiefs of the Hopi tribe included Chief Dan and Chief Tuba. Who were the enemies of the Hopi Tribe? Although a peace loving nation the Hopi tribe was subjected to frequent raids by the Navajo tribe and occasionally the Apache. The encroachment by the Spanish came in 1540 with the expedition of Francisco Vasquez de Coronado. The Native Indians were subdued but they shared in the successful revolt of 1542, but were again defeated in 1586. In 1629 The Spanish began to establish missions at the Hopi pueblos of Awatobi and Oraibi which were later destroyed in the Pueblo revolt of 1680. The Pueblo Revolt (1680-1692) was located in New Mexico and Arizona. This was an initial great victory for the Pueblo alliance that consisted of the Pueblo, Hopi, and Zuni tribes but the Spanish re-conquered the lands in 1692. For additional facts and information refer to the legend and the Story of Kind Hawk (Hopi Story) and the Boy in Jug (Hopi Story).